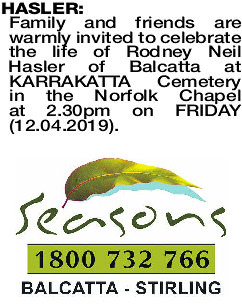 Family and friends are warmly invited to celebrate the life of Rodney Neil Hasler of Balcatta at KARRAKATTA Cemetery in the Norfolk Chapel at 2.30pm on FRIDAY (12.04.2019). 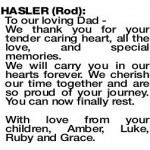 HASLER ROD You, my darling were so courageous and now the sunshine is all yours. Every day I will treasure every single memory and remember your amazing life and the glorious life we made together. I love that every step in 26 years we took together and it was my eternal honour to be your wife. We thank you for your tender caring heart, all the love, and special memories. We will carry you in our hearts forever. We cherish our time together and are so proud of your journey. You can now finally rest. 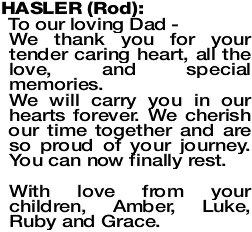 With love from your children, Amber, Luke, Ruby and Grace. God has called you home after a long illness. 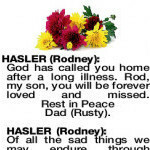 Rod, my son, you will be forever loved and missed. 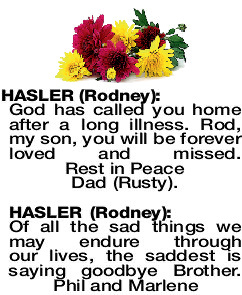 Rest in Peace Dad (Rusty). 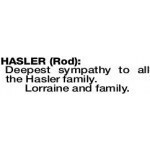 Deepest sympathy to all the Hasler family. 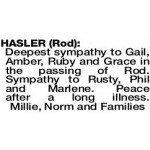 Heartfelt sympathy to Gail, Amber, Ruby and Grace also Rudy, Phil and Marlene on the sad passing of Rod. Lewi and Valma and family. 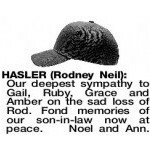 Our thoughts are with Gail and girls, Rusty, Phil and Marlene on the sad passing of Rod. Nephew of Stan (dec), Ann, cousin of Craig and Stuart. 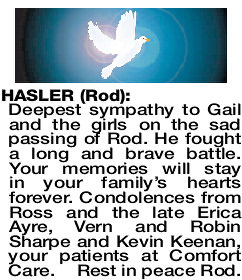 Our deepest sympathy to Gail, Ruby, Grace and Amber on the sad loss of Rod. Fond memories of our son-in-law now at peace. Noel and Ann. 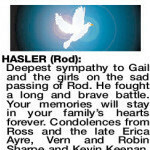 Deepest sympathy to Gail and the girls on the sad passing of Rod. He fought a long and brave battle. Your memories will stay in your family's hearts forever. 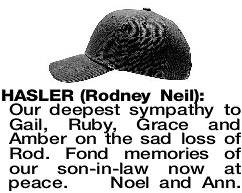 Condolences from Ross and the late Erica Ayre, Vern and Robin Sharpe and Kevin Keenan, your patients at Comfort Care. 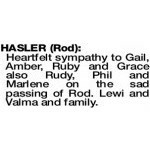 Rest in peace Rod. 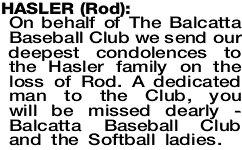 On behalf of The Balcatta Baseball Club we send our deepest condolences to the Hasler family on the loss of Rod. 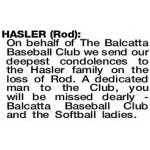 A dedicated man to the Club, you will be missed dearly - Balcatta Baseball Club and the Softball ladies.